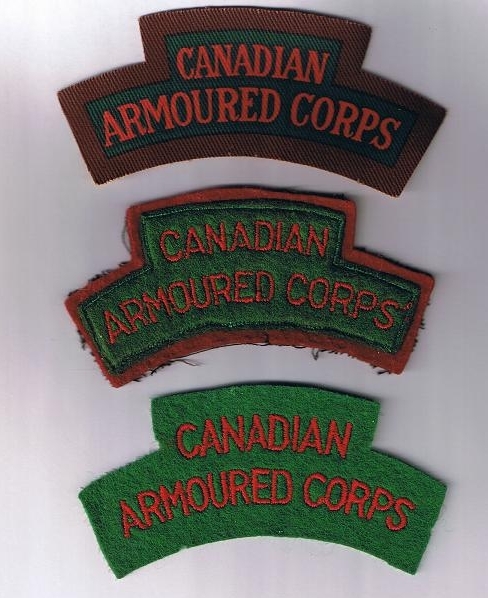 The CAC is another favourite badge of mine as there seems to have been quite a trend to modify these patterns.Here are a few examples of used badges and its obvious that the Grinding or buffing of the tank was a popular modification among serving soldiers.I,ve seen dozens done like this and only started saving them a few years back when I became interested in badges with or without provenance modified by soldiers in the field. Note the centre badge which has been vaulted and had the tank buffed shiny with the " RECCE T.C." Engraved on the tank.It also has a strange blue and red backing. Interesting stuff indeed. While I have seen quite a few CAC/CAFVTC badges that had been ground down like the ones you show, this is the first time I've seen one with additional engraving on it. "Recce TC" obviously refers to A27 Canadian Reconnaissance Training Centre - Camp Dundurn Sask. Thanks for showing a nice selection of badges and patches. Excellent Armoured Corps badges, guys! Love to see that stuff. I have a question about the time period on the CAC flashes. I have the red letters, printed on green and brown canvas title, the same in felt but also red letters on green. What time periods do each belong to? Here's a couple of other Corps crests that I've picked up over the years. More for interest than anything else. Love the rest too. Nice collection. Any of the Essex tank ones maker's marked? I stopped at capbadges and have no interest in collars or cloth as the badges were just a side line theme when there aren't any nice medals about for me!! That happens a lot as I managed to complete the WW2 armour (circa 1945)and 95% of the WW1 CMR and Cav units.